of attention, with damp already afflicting the church’s two ancient effigies. in the form of the effigies, identities unknown. The plan was to investigate the tale of the Flemings in several ways: the documentary evidence, DNA testing of local men, an archaeological dig, a monthly podcast for volunteers and friends, a film, and the creation of a tapestry, Bayeux-style, telling Llangwm’s story. The story of the tapestry is told here. The project would finish with a celebratory medieval weekend in April and May 2017. The request was granted: first of all, funds to assess the scope of the project, and then, in December 2014, the full sum. 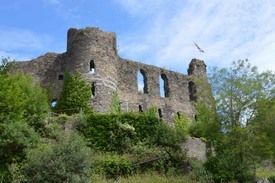 Other donors, including CADW, also came forward. And so we had the money, a wealth of volunteers, and lots of ideas - all of which became Heritage Llangwm, a joint venture between members of Llangwm’s thriving Local History Society and the parochial church council of St Jerome’s. The greater part of the money was for the refurbishment of St Jerome’s. The shopping list was huge: an eco-friendly under-floor central heating system, repairs to the roof, a toilet and concealed kitchen facilities, a plan to raise the two effigies from their plinths and insert a damp-proof membrane. There were also plans for facilities to enable the church to stage concerts and other events and, eventually, to house the tapestry. Altogether the church was closed to worshippers for 18 months, finally re-opening in March 2017. So who were these Flemings and why did they come? Our challenge was to find the answers using original, primary sources. And there were two competing theories. 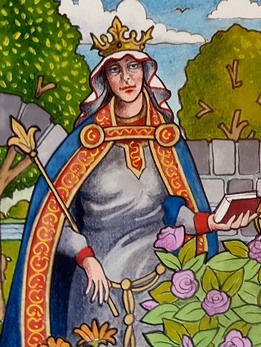 By the early 1100s there was already a Flemish community in England; William the Conqueror’s wife, Mathilde was a Flemish princess and many of William’s solders were her kinsmen. Theory number one has it that King Henry I, keen to get rid of them, sent them to Pembrokeshire to quell the troublesome Welsh. And a warlike lot they were! As for theory number two, Flemish settlers, driven from their homes by a huge storm surge and flooding, came to Pembrokeshire seeking refuge. Of course both might be true if they refer to different waves of immigration. 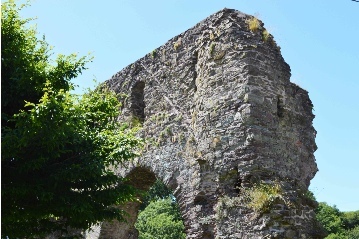 So we know that there were Flemings in Pembrokeshire, and we have documentary evidence of some of them: Tancard , or Tancred, who built Haverfordwest Castle, Leetard, or Little King and Wizo Flandrensis. But the family most associated with Llangwm was the de la Roches, later Roches. The earliest record we have of them was the birth of Godebert the Fleming in Pembroke in 1096. He also appears in the Pipe Roll, or Royal Accounts of 1130 placing him in the Cantref of Rhos, the part of south Pembrokeshire that included Llangwm. his shrouded body was found outside St Jerome’s. He was re-buried in Roch but the next day the same thing happened. 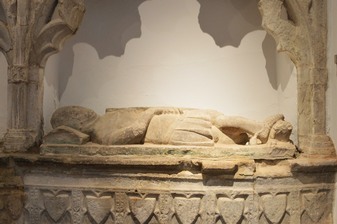 So what about the effigies in the church, a man and a woman thought to date back to the 14th century? 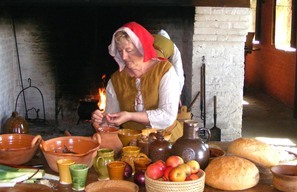 The breakthrough came when an expert investigation put the woman at around 1300, and the man at the late 1340s. We knew that they were probably de la Roches because they were found in a side chapel of St Jerome’s dedicated to the family. We knew it was a slim chance, but a TV company making a series about the genetic history of the Welsh thought we were in with a strong enough chance to film our story. Having found genetic evidence, the hunt was on for physical remnants of the Flemings. We started at the site of an old manor house a mile from Llangwm, thought to have been built by the de la Roches. 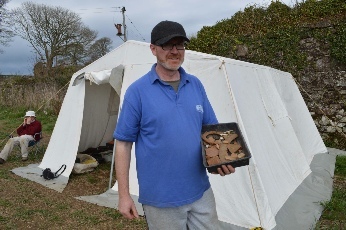 So for three weeks in April 2016, under the watchful eye of ‘real’ archaeologists James Meek and Alice Day of Dyfed Archaeology, 37 volunteers got to work. A geophysical survey told us where to dig, we prepared three trenches and set to work with trowels. 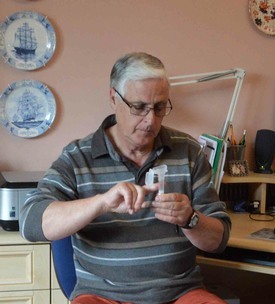 We failed – not surprisingly - to find a perfect pot with ‘Made in Flanders’ on the base but did come up with a selection of medieval pottery pieces ranging from tiny to quite large. 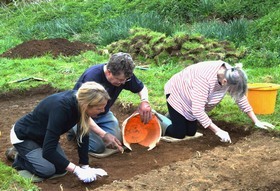 Analysis showed the earliest dated from the late 12th to 13th century and came from kilns near Bristol. Pieces of ceramic pots dating from the 13th to the 15th century were felt to have been produced either locally or in Devon. The only continental import was a tiny piece of a late 16th or 17th century vessel produced in Germany. And we also found a selection of late Mesolithic flints 6,000 to 7,000 years old. But that’s another story, and perhaps another website! Click here to go to our dig diary. The Search for Little Flanders will be available on DVD from Spring 2017. It tells the story of Heritage Llangwm’s quest for information about the Flemings, recounted by members of the team. think the female effigy, again using records of births and deaths, was his grandmother Margaret. 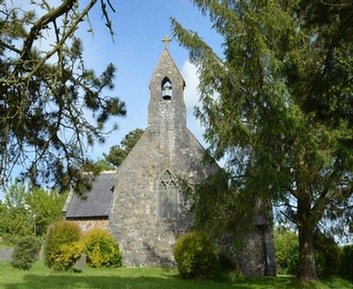 Llangwm resident had a rare combination of markers that corresponded exactly with those of a group of men named Roach or Roche in Ireland, who it’s believed had descended from Godebert’s sons after their invasion of that country in the 1160s. And as if that were not enough, a research visit to Belgium uncovered evidence of ten more men there with those exact same rare markers. So we finally had proof of Flemish heritage for at least one Llangwm man.